Shell Lubricants, the global market leader in lubricants for 12 consecutive years, has announced a new strategic partnership with Mahindra & Mahindra Ltd, a part of the USD20.7 billion Mahindra Group. Under this agreement, Mahindra and Shell will work together to offer market-leading, high-performance lubricant products, such as engine oils, transmission and axle oils, including those under the ‘Maximile’ brand. These lubricants will be distributed through the Mahindra dealership network and bazar networks through the Mahindra spares business unit. The Shell-Mahindra partnership rides on the theme of ‘Together Towards Tomorrow,’ where both organizations are committed to developing innovative, unique and differentiated technologies and products. 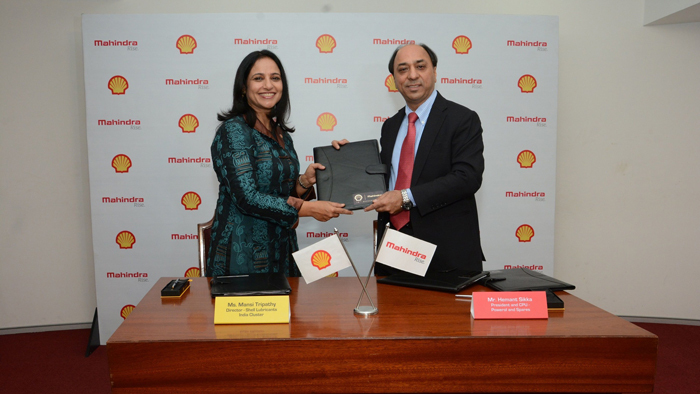 The agreement is a major step in this direction and was signed in Mumbai by Mansi Tripathy, country head, Shell Lubricants, India and Hemant Sikka, president & chief purchase officer, Powerol & Spares Business, Mahindra & Mahindra Limited. “We are delighted to partner with Mahindra and look forward to bring next-generation mobility solutions and new technologies to the Indian market. At Shell our emphasis has always been to provide customer delight, fill unmet needs, bring innovative technologies for a better future and mutually grow business. The partnership with Mahindra is a major step in our effort towards this journey,” Tripathy said.